Ashley Schindele steals the ball in Kimball’s game against Maple Lake Thursday. Photo courtesy of Amanda Garding. The Cubs closed out frigid January on a bright note, defeating Maple Lake, 66-46, last Thursday night. Rachel Utecht started Kimball’s first scoring run and Sidney Schreiner finished it, putting the Cubs up 13-4, six minutes into the contest. Schreiner and Utecht scored back-to-back field goals with four minutes to play in the first stanza, giving Kimball a 34-23 halftime lead. Ashley Schindele joined the party, hitting ten straight points and lifting the Cubs to a 48-33 advantage with 11:03 to play. Following an Irish bucket, Kimball’s Erin O’Brien and Rachel Utecht combined on a 9-0 run and put the game on ice, 57-35, with 7:27 remaining. Teammate Madelyn Hunt scored the final four points, to help finish the impressive Cub victory. 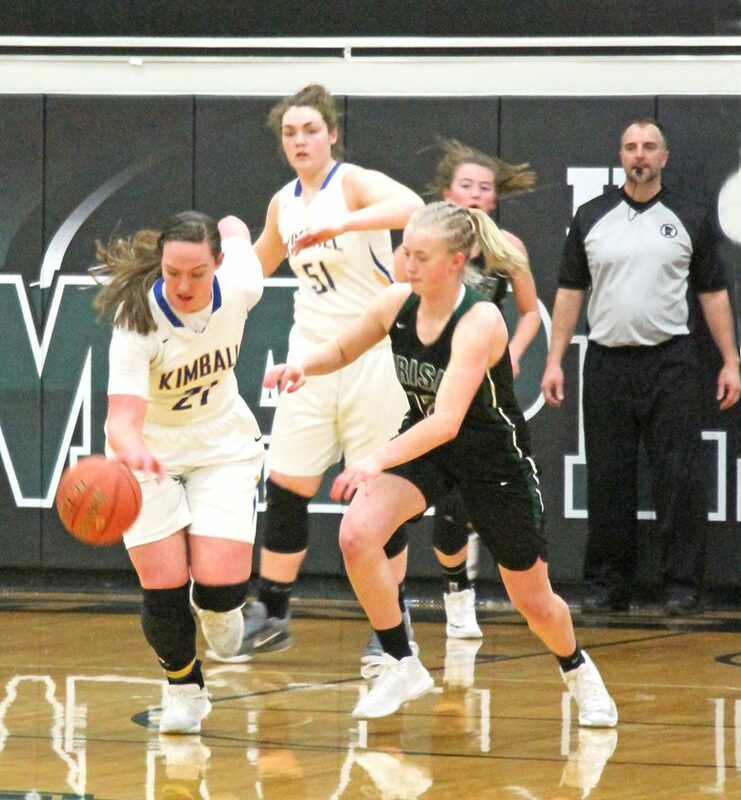 Kimball Stats: Ashley Schindele, 20 points, 6 rebounds, 3 steals; Erin O’Brien, 16 points, 8 rebounds, 6 assists; Rachel Utecht, 13 points; Sidney Schreiner, 8 points, 3 assists; Cailyn Kuechle, 5 points, 4 steals; Madelyn Hunt, 4 points, 3 assists; Holly Berscheid, 2 steals. The win puts Kimball’s record at 8-11 overall and 4-4 in the CMC. “Coming off no school or practice since Monday, with these record-cold temps, I wasn’t sure what kind of performance we would see tonight, but the girls came out hungry as a team and were really engaged in their responsibilities. I guess we can say the cold snap is officially over, as the girls turned up the heat in the gym tonight…it was fun to watch them play well,” Coach Jeremy Kuechle said.